Posted on April 18, 2019 at 9:33 pm. On April 11, 2019, Free Speech For People joined Demand Justice and a coalition of sexual assault survivors’ organizations and other progressive groups to urge House Democrats to investigate Justice Brett Kavanaugh’s Supreme Court confirmation. Free Speech For People first called for an impeachment investigation of Brett Kavanaugh in October 2018, due to multiple allegations of sexual assault, perjury, and bringing the judiciary into disrepute. But the fight for justice continues. Senate Republicans made a mockery of their constitutional responsibility to provide “advice and consent” on the president’s nomination of Justice Kavanaugh, and the American people deserve to know how and why the process was such a sham. We stand with Demand Justice and the more than two dozen groups that signed the letter urging the House to investigate Justice Kavanaugh’s sham confirmation. To read the full letter, click here. And to read more, check out the article in Buzzfeed News. Posted on April 11, 2019 at 4:20 pm. The battle to access the full Mueller report is raging in Congress. Last week, the House Judiciary Committee authorized a subpoena to require Attorney General William Barr to provide Mueller’s full, 400-page, unredacted report of his investigation. However, in a recent decision, McKeever v. Barr, the court “reaffirmed the principle of grand jury secrecy and concluded that a court has no ‘inherent power’ to release grand jury information.” This decision could give Barr a plausible basis to resist the subpoena and to continue his cover up of vital information due to Congress and the American people. In a recent op-ed, Philip Allen Lacovara, former counsel to the Watergate special prosecutor and Larry Tribe, a law professor at Harvard Law School, argues that the strongest legal recourse available to the House is to open an impeachment inquiry. During the Watergate investigation, the special prosecutor working with a grand jury developed a report detailing the evidence tending to show that President Richard M. Nixon had committed various federal crimes, including obstruction of justice, that might constitute grounds for impeachment. He explains that opening a formal impeachment inquiry against Nixon allowed the House Judiciary Committee to bypass the decision of “grand jury secrecy,” and allowed the Committee to access the report and underlying evidence against President Nixon. Given this history and the challenges facing the House to fully access the Mueller report, the House Judiciary Committee should focus on its strongest argument and start an impeachment inquiry against President Trump now. Trump’s selection of his new attorney general may prove to be his best line of defense — unless Pelosi revisits her stance and directs the House Judiciary Committee to include impeachment within its investigatory ambit. Read the op-ed in the Washington Post here and read more about the fight to access the Mueller Report in Politico here. Posted on April 3, 2019 at 3:00 pm. Last week, Free Speech For People Legal Director, Ron Fein, sat down with Sonali Kolhatkar, on Rising Up With Sonali, to discuss the end of the investigation by Special Counsel Robert Mueller and its implications for Trump’s future. Regardless of whether Trump committed any “crimes,” we still have plenty of evidence that President Trump has gravely and repeatedly violated the Constitution. The Mueller Report should be made public, but Trump’s actions have already spoken for him, and the answer is impeachment. Watch Ron Fein’s discussion on Rising Up with Sonali below to learn more about these violations and why the end of Mueller’s report does not mean an end to impeachment. Posted on April 1, 2019 at 8:34 pm. President Trump has been directly implicated—by his own personal lawyer—in a criminal conspiracy to illegally influence the election. This justifies an impeachment investigation. On August 21, 2018, President Trump’s personal lawyer, Michael Cohen, pleaded guilty to eight criminal charges. Two of those charges stem directly from criminal actions that he took at the direction of then-candidate Trump in connection with Trump presidential campaign. Posted on March 14, 2019 at 9:04 pm. Thursday, March 14, Free Speech For People Co-Founder and President, John Bonifaz, was on Democracy Now! to make the case for why Congress must immediately begin impeachment proceedings against Donald Trump. Watch the interview below and read the transcript on Democracy Now! Posted on March 11, 2019 at 9:00 pm. Has President Trump committed impeachable offenses? Watch former Congresswoman Elizabeth Holtzman, Free Speech For People Legal Director Ron Fein, and Fordham Law Professor Jed Shugerman discuss the case for impeaching Trump. Posted on March 7, 2019 at 10:41 pm. At a press conference held on Wednesday, March 6, Representative Rashida Tlaib announced that she plans to file a resolution this month to start an impeachment investigation of President Trump. Read more about Representative Tlaib’s press conference and her plans to file the resolution in the Detroit News and in Newsweek. You can also read Representative Rashida Tlaib’s op-ed, co-authored with John Bonifaz, in the Detroit Free Press here. Posted on February 5, 2019 at 12:52 am. It’s time to begin impeachment hearings against President Trump. The political-media establishment continues to insist that Congress shouldn’t rush to impeach, but that’s a straw man. Nobody seriously argues that the House should vote now whether to impeach. Instead, it should begin as every impeachment proceeding has begun: with impeachment hearings. Impeachment is a three-part process. The second and third steps — a vote to impeach in the House of Representatives, and then a trial in the Senate — are specified in the Constitution. But congressional impeachments always begin with a critical first step: The House Judiciary Committee investigates whether to recommend articles of impeachment to the full House. The committee subpoenas documents and testimony, prepares legal analyses, and holds hearings. Through this investigation, the committee determines what the president has done, and whether it constitutes grounds for impeachment. We can learn from the Nixon impeachment process. The Judiciary Committee didn’t sit around waiting for the Watergate special prosecutor. Instead, it started its impeachment inquiry on Oct. 30, 1973 , before the new special prosecutor was even appointed. In fact, the committee didn’t receive a report from the special prosecutor until March 1974. If Congress had waited for that report before even starting, Nixon might have remained in office for another year. Click here for the full op-ed. Posted on January 31, 2019 at 10:17 pm. Earlier this week, Free Speech For People joined Need to Impeach for a critical two-day Impeachment Summit. The Summit featured a panel by Free Speech for People legal experts, a press conference, activist trainings, and an advocacy day. On Monday, our legal experts addressed over 250 activists from around the country on the 10 legal grounds for impeachment proceedings against the president. Watch the full panel below! On the panel (seated left to right): Legal Director Ron Fein; Board Member and Vermont Law Professor Jennifer Taub; President and Co-Founder John Bonifaz; and Board Chair Ben Clements. Activists from across the country listened to the legal case for impeachment proceedings against Donald Trump. We also helped to prepare them to deliver our book, The Constitution Demands It: The Case for the Impeachment of Donald Trump, and drafted Articles of Impeachment to give to every Member of Congress on Tuesday. Free Speech For People President, John Bonifaz, delivers The Constitution Demands It and associated materials to Speaker Pelosi’s office. Board Chair Ben Clements spoke at Tuesday’s press conference, outlining the legal and Constitutional case to begin impeachment hearings and why we cannot wait for the Mueller investigation. Congressman Al Green was also among the featured speakers at the press conference, speaking about why Congress must start impeachment proceedings now. FSFP Board Members Stephanie Sanchez, John Bonifaz, Jennifer Taub, and Ben Binswanger with Congressman Al Green in his office on Capitol Hill. The Impeachment Summit proved that We the People can and will stand up for our democracy and hold Donald Trump accountable for his repeated abuses of power. Thank you to all the activists, volunteers, and organizers for their efforts and commitment to our democracy. To take action, click here! Together we can fight corruption and begin impeachment proceedings against this president. Posted on January 31, 2019 at 6:06 pm. Free Speech For People President, John Bonifaz, delivers our book on the legal grounds for impeachment to House Speaker Nancy Pelosi. On January 29, 2019, Free Speech For People joined Need to Impeach and activists from across the country to deliver new resources to members of Congress to immediately begin impeachment proceedings against the President for his continued lawlessness and ever-increasing egregious abuses of power. The day of action concluded a three-day Impeachment Summit gathering organizers and activists, legal experts, and more, in Washington, DC, to build and grow the nationwide movement to hold the President accountable to the law. Free Speech For People developed the new resources distributed to Members of Congress including the ten legal grounds for Congress to launch an impeachment investigation of the President; a resolution for Congress to authorize impeachment hearings; and model articles of impeachment. 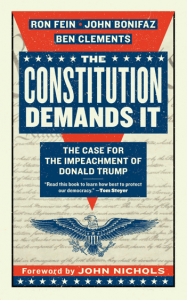 We also delivered a copy of our book, The Constitution Demands It: The Case for the Impeachment of Donald Trump, to every Member of the House of Representatives. To download our new resource packet for legislators, click here. Watch out panel on the legal grounds for impeachment proceedings against the President below!